Put something pink on a tuna melt and I’m bound to eat it. Even though I have always been a fan of tuna. Always! While my brothers would turn their noses up at it when we were kids, I loved it. My mom would make tuna sandwiches often and the only thing I’d complain about was the celery. I wasn’t into hot tuna dishes (like tuna noodle casserole, no thanks), but cold versions of the salad? I probably loved it too much because I ended up avoiding it for years. And I was actually super picky about tuna. I would NEVER order it somewhere because I didn’t love mayo, and those creamy salads had so much of it that I couldn’t stand anyone else’s version but my mom’s. Once I got older and started cooking on my own or preparing lunches for work and stuff like that, I started eating tuna with olive oil and herbs. That’s how I really loved it. Anyhoo, I already told you all about this! I’m the most broken record to ever exist. A few weeks ago we had lunch at Mediterra and this sandwich was inspired by their grilled tuna melt. It was SO good. No mayo, tons of flavor and lots of texture too. It was exactly what I wanted. Lacy and I split that among a million other things. Max ate a coconut pancake. Emilia ate an almond butter sandwich along with bites of anything (and everything) she could grab. We had coffee and my mom had hot chocolate and Max ate three or four desserts. I can’t remember. Needless to say, we were huge fans. Tuna melts can be rather polarizing. I mean, tuna in general can be polarizing, especially if it’s not ahi. So it might be crazy that this is the second version of a tuna melt that I’m sharing in one year. But! Those green goddess tuna melts were one of said creamy versions. Tuna with olive oil is something I make myself for lunch often though, so it had to be done! Plus, since we all look for new and improved lunch ideas, I figured why not. This very moment, I’m into sharing super practical, easy meals that don’t take forever to make. That’s why this exact tuna melt may be more of a weekend lunch or even a quick weeknight dinner, but either way, it’s deeeelish. 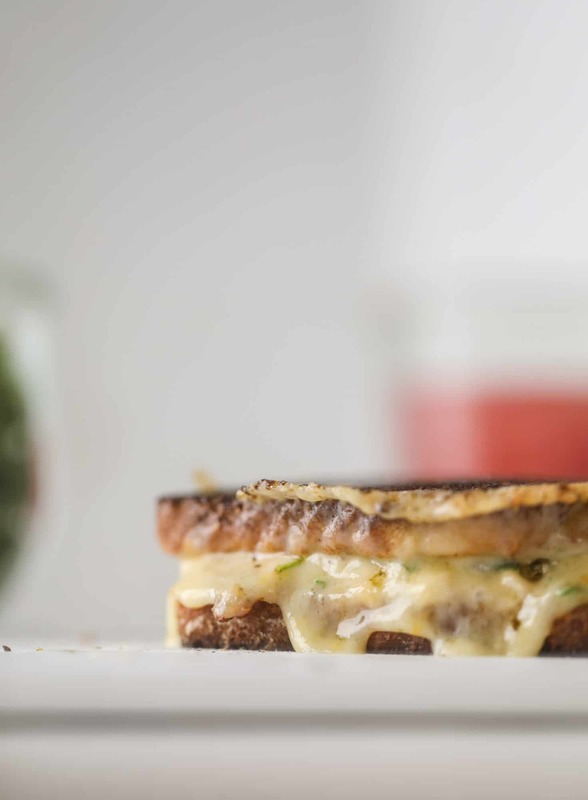 A fancified tuna melt, if you will. A little mix of tuna with olive oil and fresh herbs. A quick homemade spread of sun dried tomatoes, lots of peppery arugula, some manchego cheese and quick pickled onions. Lots of salt and pepper. A whole boatload of flavor. Even Emilia ate an entire sandwich. It so flavorful, crunchy, a little buttery and cheesy. At the same time, it’s relatively light if you’re using a small slice of bread or serving it open faced like the green goddess tuna. And I have to say… it pairs nicely with cold pinot grigio. Try it! 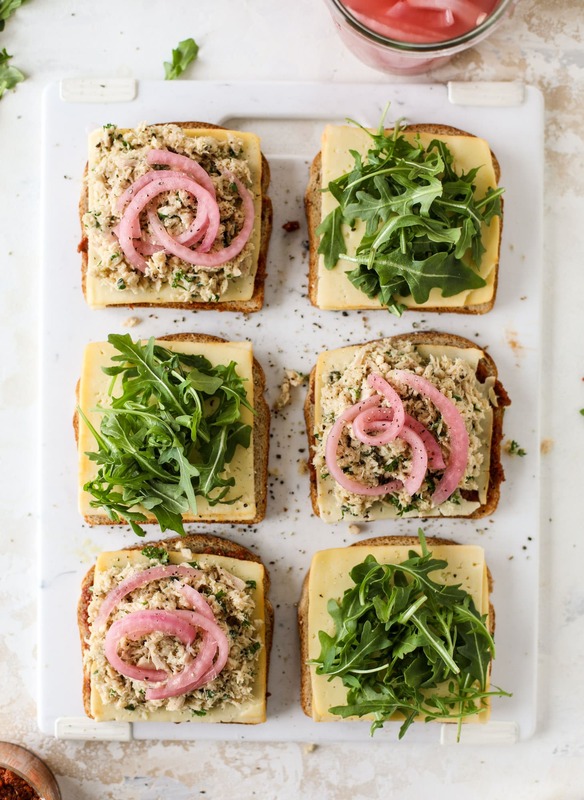 These tuscan tuna melts are a modern way to enjoy a tuna sandwich, with peppery arugula, melty cheese, pickled onions and sun dried tomato spread! In a bowl, mix the tuna with the olive oil, fresh herbs, salt and pepper. Stir until combined. You can also just buy the tuna packed in olive oil, but I like having a little more control over the oil situation! To make the sun dried tomato spread, drain the tomatoes from the olive oil in the jar. Add the tomatoes to a food processor and blend until pureed. To make the sandwiches, spread a tablespoon of the tomatoes on one (or both!) sides of the bread. Heat a large skillet over medium heat. Spread the outsides of the bread with softened butter. 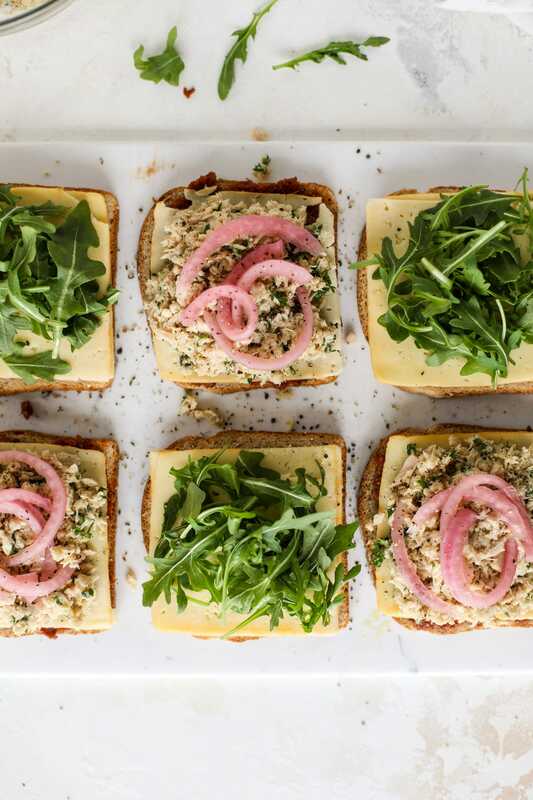 Assemble the rest of the sandwich by adding 1 or 2 slices of cheese, a scoop of the tuna, a few pickled onions and a handful of arugula on one slice. Cover it with the other slice of bread. Cook the sandwich in the skillet until the cheese is melted and bubbly and the bread is golden brown. Serve immediately! Clearly all is well in tuna land. I too love tuna, but I never thought to enjoy it with sundried tomatoes (which I also love). Thank you for the meal inspiration, as always! they are the best combo!! I’m the same way with tuna! I always loved my mom’s tuna sandwiches, but would never order one or eat one made by someone else… I like a little mayo in it, but other people make them so wet and gloopy… it should still be a chunky salad, not a mushy spread! And we also never ate hot tuna growing up. Now I’ll occasionally order a tuna sandwich out if I trust the place, but prefer to make them at home, and LOVE a good homemade tuna melt! This one looks amazing…must make soon! could not agree more!! i’m afraid to order it anywhere when it is the creamy kind! THIS is how I adore tuna. I’m mayo-aversed, too, and I couldn’t stand the smell of canned tuna as a child. But this? I’d eat it every week. Love Mediterranean flavors! bahahah thank you!!! yes, totally meant quick!! what the heck. lol. I seriously cannot get enough of Mediterra Café.! It is my go-to spot anytime someone visits from out-of-town and is looking for a low-key brunch outside of the city. Just made this tonight… not with Pinot Grigio but a glass of Chablis…OMG… so so good… my 14 year old son had the other sandwich and he loved it… definitely will make again!